How often do we walk through our daily routine without opening our eyes, without raising our gaze from the pavement, unaware of the numerous unique eccentricities of our surroundings? I find myself dragging my feet, stumbling from point A to B, only partially aware that I am missing something, a certain neglected "something" that must make one day different from the next. In fact, one of the reasons that I moved to Israel is because here, in this strange land with these strange people, I readily notice that life can be stranger than fiction. People do bizarre things. Store signs are absurd. Politics are comical. Food is alien. The otherworldly nature of Israel forces me to open my eyes; forces me to concentrate on something other than my own ruminations. So, after walking out of class and rushing back home to start working, I crossed the street with eyes wide open at the subject of this picture. Without going into a big long explanation of all the various religious groups here in Jerusalem, let me just offer this one horribly oversimplified commentary. Essentially, the more black dress-clothes that a Jew is wearing, the more traditional they are. The more "orthodox," as the English term goes. For example, if you see a guy wearing jeans and a T-shirt, but also a knit black yamika, he's really a "modern orthodox" Jew. He keeps Shabbat and kosher, but he may or may not really be so strict in Jewish law - or at least he would do things outside of the traditional laws of modesty, like go to bars. If you see a guy wearing black dress pants and a blue dress-shirt, completed with a white yamika, he probably is a little more strict, probably prays the three regulated prayer sessions a day, absolutely keeps kosher and Shabbat, and more than likely he has spent some time in a yeshiva. Now, finally, if you see a guy with a black suit and a white dress-shirt, black yamika, and even a black overcoat - well, his entire life is religion. He more than likely studies Torah and Talmud all day, every day. He more than likely requested exemption from the Israeli Army in order to live this religious life. He really doesn't go out to bars, he doesn't hang out downtown and people-watch, he probably doesn't go to movies, and he certainly doesn't have a television at home. Also, chances are that he doesn't work, but rather studies in yeshiva for a stipend. This lifestyle is referred to as being frum in Yiddish, or haredi in Hebrew, and ultra-orthodox in English. This group is what you see in Crown Heights and Flatbush, Brooklyn. These are the diamond dealer Jews in NYC. These are the people that live in Mea Shaarim in Jerusalem. They catch a lot of flak wherever they live, and they can be more than controversial with religiopolitical views, but I have enormous respect for this spiritual pillar of Jewry. Like so many societies around the world, the revolution in technology and the globalization of culture has led to the youth of even the most traditional communities to adopt what many would consider "modern" ways of life. These adopted patterns and habits can be seen all over Jerusalem, the center of traditional Judaism for the entire world, and are of course the domain of the youngsters. Walk into any little falafel restaurant or mini-market that has a TV for watching sports games, and there you'll see a crowd of teens in black suits watching Euroleague soccer, drinking Coca-Cola, and smoking Marlboros. Or, go to the downtown square on a Thursday night, the big party night in Israel, and amidst the roaring secular revelers you will find a clustering of religious boys nursing a bottle of vodka, observing the mayhem unfold. The religious have cellphones, iPods, and digital cameras. They will attend sporting events. You'll see them in the mall. The orthodox community is being led from the ghetto, the shtetl-life, an enclave that has defined them for the past millennia. That being said, some things are still just unheard of. Mopeds are very popular here, namely because they are cheap and gas efficient. Secular and religious guys both ride them, with no clear tendency for one or the other to have this vehicle instead of a car. Not a big deal. Secular girls can occasionally be spotted on a moped, as I chanced upon a few days ago, and although it merits staring, it's still not anything to write home about. 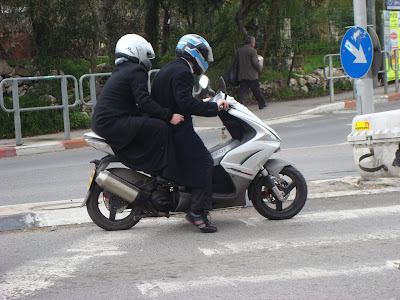 But, what I have only seen once during all the combined time that I have lived in Israel is an ultra-orthodox, frum, haredi couple riding one of these things together. It's just too much! They're married, of course, but there's still too much touching going on in public for the traditional laws (which ban all touching between the genders outside of marriage -- all touching). The suggestion of sexuality is simply too strong, with the female's legs being essentially wrapped around her husband. It's just not seen. So, when I was crossing the street after my Hebrew class and walked right by this ultra-traditional couple going along in a very untraditional manner, and I dare say anti-traditional manner, I couldn't help but open my eyes. I couldn't help but lift my head from the pavement, pull my mind out of the clouds, and focus all of my attention on a sight that I figured I probably wouldn't see again for quite some time. Realizing that I had taken my dad's advice and permanently placed my camera in my backpack, I ripped the camera from it's case, fearing that the stoplight would turn green any second, and took as many shots as I could. As their light remained red longer than expected, I looked to the drivers of the cars around them and noticed that every single head was pointed in their direction. Honestly, a picture is worth more than a thousand words. Notice one thing among a hundred others that I could mention: His shoes. He's not wearing black dress shoes, though he has on every other element of the ultra-orthodox garb. Rather, he is wearing the ultra-hip Puma-style sneakers, a fashion that threatened to put my beloved New Balances out of business recently. This is really what I see as a new wave in the ultra-religious youth and young adult segment, and it is a trend that I feel a true affinity towards. They do not want to leave behind the traditional garb, so they will continue to wear black suits, white shirts, long black overcoats, and black Fedora hats. The women will continue to dress in black and cover nearly all skin and hair. The change, however, is that there is a real effort to dress poshly, to keep up with the fashions of the day. The guys will get nice suits, white dress shirts that have special patterns in the fabric (like tiny squares or lines) or fancy buttons, expensive shoes, and they'll keep all of it very clean. The women will wear name brand clothes or dresses with a long-sleeve shirt underneath to make sure the laws of modesty are covered, as is their skin. Instead of wearing a wig (women have to cover their hair), they'll get a glittery scarf that really is quite pleasant to the eye. This combination of dress-clothes and modern fashion is, in my opinion, one of the classiest, hip, and sophisticated styles that I have ever seen. I like it. The point here is that even in Jerusalem, the holy city, and even within the most religious and time-tested, uncompromisingly ancestral groups, the power of Western culture is just about unstoppable. There is so much talk about the plight of the American economy right now. Turn on European television and I guarantee you if you listen for half an hour you'll hear about "the falling dollar." No matter, though, the pervasiveness of the American way of life is stronger than ever, and it has reached its hand deep into a congregation that had no intention of accepting any outside influence. Man, Danny. Nice observations. Really appreciated the commentary. And I totally agree about the amazing ability that Israel has to un"self-centralize" one once they live here. Noticed the shoes right away. Those pink things stick out like a sore thumb. And his helmet. A little flashy for ultra orthodox, of any religion. Keep doing your thing. I feel my job search may be ending with employment soon. Keep fingers crossed. ha, over here that is a very unflashy style! compared to some of these kids that love to pick up the whole eurotrash look. i love em, though. not sure I understand what you mean un-centralize. You mean the country can make people change their customs or something?